It’s that time of the election season again, when Latino celebs start to make the rounds with appeals for their candidates. Sometimes I question the effectiveness of it all especially since many celebrities are in the 1% and don’t necessarily convey the struggle of the average Latino. Of course, I know that many of these stars come from humble beginnings. So here’s a piece I recently wrote questioning the Obama campaign’s use of George Lopez in their Latinos for Obama outreach efforts. This is a guy who is known for saying, “F&#@ that puto!” Is this the kind of celeb the Latinos for Obama outreach arm wants to promote? And do other Latinos identify with his humor? NO…when are we going to take notice 0f these things…we have serious problems in the LATINO community and for the President to go to a comedian (and celebrities who REALLY are disconnected) says a lot about how they see us and more importantly how seriously they take us–not very. NOBAMA 2012!!! The Use of Latino Celebs in the Obama Campaign is just another example of how little the Democrats think of Latinos. We don’t read or think, all we do apparently is watch TV. In my view, the Obama administration has been an abject failure. Sadly, there is no candidate on either side that I will support. Although I have seen the Latino community through George Lopez’s eyes, this idea is just a tad bit more positive than using the radio disk jockey Piolin to appeal to Latino voters. I realize the Obama Campaign has probably witnessed too much disparaging behavior from the Latino organizations, the large non-profits, and the Sanchez sisters, but the reality is Obama can still lose this race. And no person of color wants to endure four years of George W Bush Mormon style hypocrisy, fiscal scandal, and duplicitous behavior at the White House funded by your tax dollars. The Latino community has Raul Grijalva, Hilda Solis, and Justice Sotomayor to look up to as examples of genuine political leadership. Actors and comedians just lend to the circus mentality that already plagues the Latino community. Look no further than Sabado Gigante with Don Francisco as an example of how the world views us. All it takes is one Secure Communities checkpoint experience to clarify how low we sit on the food chain. Although I find it hard to believe Barack Obama sees value in expanding this (Secure Communities) Gestapo-like program, I realize he has to pander to the Bible Belt, the Prison Industrial Complex, and the racist element. This episode with George Lopez hosting the campaign call just smells like a loud political fart. There I wrote it, and I stand by it. g lo. iz the kinda latino that should b on the campaign. ahahah. ftp! he shares the predominant “sentiment” of our community on this issue. or at least it seems that way.. he shouldn’t be bullied to assimilate to a post modernist culture…semos chicanos. Why do you think that Obama does not support Secure Communities? Judge him by his actions, not his empty words, and certainly not by how you think he probably feels. That’s just your own projection. 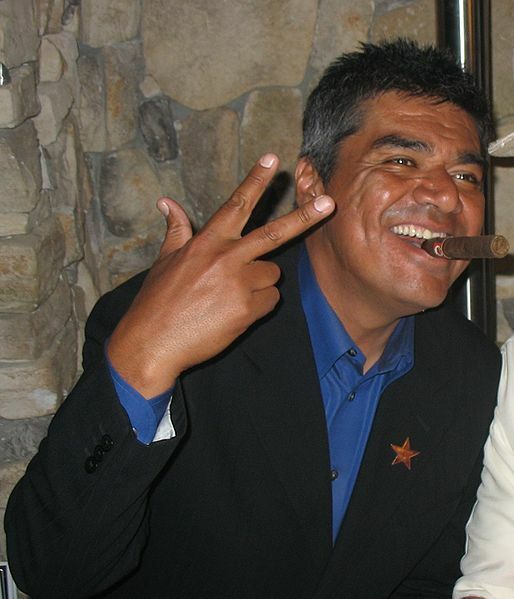 George Lopez is a lame excuse and not a representative of Latinos. This is a man who makes his money degrading Women and stereo types us all. This is not a comedy show but a very important exercise in democracy. I always find it hard to digest why we cater to celebreties who are out of touch with reality.